LED outdoor lights draw more insects than sodium lamps, independent of the LEDs' color temperature or intensity. Chalk up one more unwanted effect of excess blue light. The Smithsonian has a summary of research published in the journal Ecological Applications -- here's the abstract. Researchers in New Zealand placed isolated lights in a field with sticky paper nearby to catch insects that were drawn to the lights. They wanted to test a hypothesis that more insects would be drawn to light with more blue in its spectrum than to the yellowish light from sodium lamps. 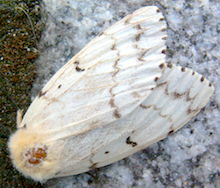 The female gypsy moth, an invasive pest that is more sensitive to blue light than humans are. This hypothesis was borne out. Comparing six varieties of industrial LED lights with differing amounts of blue in the spectrum, researchers Stephen Pawson and Martin Bader found that the average LED attracted 48% more flying invertebrates than sodium lights did. Pawson and Bader work for a government-funded research institute called Scion, which supports New Zealand's forestry industry. You can perhaps see why they would be concerned about a light source that brings in half again as many flying pests -- some of which could prove unhealthy for trees. Insects have visual receptors that are tuned for blue light. "Large-scale adoption of 'white' lighting is likely to increase the impacts of nighttime lighting on all species sensitive to 'blue' light," Pawson told Smithsonian Magazine. He attributed to a cutoff effect the lack of difference observed with LEDs of differing spectra -- no matter the size of the blue peak each lamp exhibited, its light contained enough blue to affect insects' behavior. We have been writing about the unwanted effects of lighting at night, particularly LED-based lighting, for some time. (See the related posts.) This study presents another example of how the blue peak characteristic of phosphor-converted white light from a blue LED has unintended consequences in the wider environment. Insects are not the only creatures whose sensitivity to blue light is different from that of humans. Though our (photopic) sensitivity curve has an almost Gaussian shape centered on green, the curve for chickens, for example, is bimodal with peaks in blue and red. (A good amount of research has been done on chickens and lighting.) Other creatures' vision systems are all over the map. As energy-efficient LED lighting tempts humanity to use more light at night, it will be increasingly important to understand and ameliorate the effects we are having on the surrounding environment.